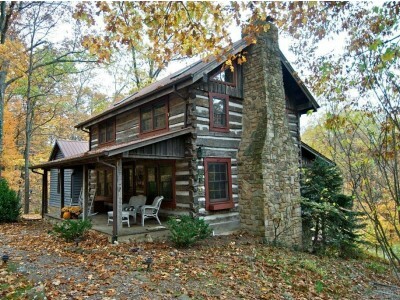 Nestled in the woods just 12 minutes North East of Nashville and 10 minutes from Brown County State Park, you will find Wildflower Ridge Log Cabin. Close to shopping and adventure, yet you will feel very secluded in this authentic log cabin made of antique logs from a barn of yesteryear. Upon arrival, you will notice a restful feeling as you drink in nature’s bounty, walking down the path to the front door. Entering the first floor, you will find a cozy living room with a Rumford wood burning fire place, made of Brown County stone. Snuggle up by the fire and watch a movie or just admire the large hand hewn log walls and beams around you. Off the living room is a large, fully screened, covered porch. What a great place to gather to visit with family and friends. Notice the birds in the nearby trees, who don’t even realize you are right there. The kitchen is fully equipped for all your cooking needs. Providing plenty of prep. space on the beautiful oak countertops. The adjacent dining room will comfortably seat 8 at the oak farm table. Maybe you would like to dine by candlelight? Our handmade tin chandelier is equipped with realistic candles, no matches needed. Down the hall, in the addition, you’ll find a full bath with an antique footed soaker tub. Come hang out in the family room, with built in book shelves and a window seat it’s a great place to read, play games, work puzzles or just enjoy the view. This room also serves as a sleeping area with two full sized futons. Follow the stairs to the second floor complete with vaulted ceilings, log beams and skylights in every room. The spacious master bedroom offers a king sized bed, comfy loveseat and antique dressers. The second bedroom offers a queen sized bed along with antique furnishings. Adjacent is a roomy shared full bath. Heading downstairs, to the game room, Play a game of pool or head out the back door to the deck. Dine out on the partially covered deck with charcoal grill and hot tub, overlooking the pond and surrounding woods. At dawn and dusk you may catch a glimpse or more of the deer playing in the edge of the pond- a now daily occurrence. Swing on the porch swing, wander thru the wildflowers, enjoy a campfire….Come, stay a while, you’ll be glad you did!